The Arcadia area, on the southern foothills of Camelback Mountain in Phoenix, is the warmest area in the valley. If you live in the Phoenix area, as I have for years, that doesn't sound like much of a recommendation, certainly not in summer. But you have to look at it from the perspective of winter visitors, wealthy homeowners, and oranges. • Tourists. For the past eighty years, a huge amount of the economy in Phoenix has been based on tourism. And, unlike us desert rats, who suffer through the summer, these people do not want to be cold. They are coming from places with snow and ice. And they want to get out into the warm sunshine. So if you could choose anywhere in Phoenix to build a tourist resort that would have the least cold temperatures in the valley, you would build it on the southern foothills of Camelback Mountain. • The wealthy. As for the wealthier crowd, they can afford to be away in the summer. Many of those big, beautiful mansions in Arcadia are only visited by their owners in the winter. And they want to be warm. And because this area faces south, and is on a slope, it gets the most sunshine, and the least frost, in the valley. • Oranges. And that brings us to oranges. 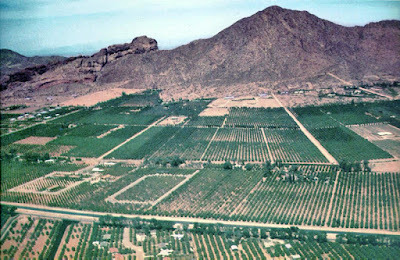 Long before the tourists, and the wealthy landowners, this land was the best in the valley to grow oranges. That's because of the above reason, the most warmth, the most sunshine and the least frost. Image at the top of this post: Arcadia in 1956, southern slope of Camelback Mountain, Phoenix, Arizona.